This article is about the airline known as American Airlines. For a list of airlines of the United States, see List of airlines of the United States. American operates out of ten hubs located in Dallas, Charlotte, Chicago, Philadelphia, Miami, Phoenix, Washington, D.C., Los Angeles, New York-JFK, and New York-LaGuardia. American operates its primary maintenance base at Tulsa International Airport in addition to the maintenance locations located at its hubs. Dallas/Fort Worth International Airport in Dallas is American's largest passenger carrying hub handling 51.1 million passengers annually with an average of 140,000 passengers daily. The company as of 2015 employs over 113,300 people. Through the airline's parent company, American Airlines Group, it is publicly traded under NASDAQ: AAL with a market capitalization of over $40.99 billion as of 2015. American Airlines was started in 1930 via a union of more than eighty miniature airlines. The two organizations from which American Airlines was originated were Robertson Aircraft Corporation and Colonial Air Transport. The former was first formed in Missouri in 1921, with both being merged in 1929 into holding company The Aviation Corporation. This in turn, was made in 1930 into an operating company and rebranded as American Airways. In 1934, when new laws and attrition of mail contracts forced many airlines to reorganize, the corporation redid its routes into a connected system, and was renamed American Airlines. Between 1970 and 2000, the company grew into being an international carrier, purchasing Trans World Airlines in 2001. In 2011, due to a downturn in the airline industry, American Airlines and AMR Corporation filed for bankruptcy protection. In 2013, US Airways acquired American Airlines. Eventually operations were merged under one operating certificate to create the largest United States airline which kept the American Airlines brand name. American Airlines is headquartered in Fort Worth, Texas, adjacent to the Dallas/Fort Worth International Airport. The headquarters is located in two office buildings in the CentrePort office complex and these buildings together have about 1,400,000 square feet (130,000 m2) of space. As of 2014 over 4,300 employees work at this complex. Before it was headquartered in Texas, American Airlines was headquartered at 633 Third Avenue in the Murray Hill area of Midtown Manhattan, New York City. In 1979 American moved its headquarters to a site at Dallas/Fort Worth International Airport, which affected up to 1,300 jobs. Mayor of New York City Ed Koch described the move as a "betrayal" of New York City. American moved to two leased office buildings in Grand Prairie, Texas. The airline finished moving into a $150 million ($357,000,000 when adjusted for inflation), 550,000-square-foot (51,000 m2) facility in Fort Worth on January 17, 1983; $147 million (about $350,000,000 when adjusted for inflation) in Dallas/Fort Worth International Airport bonds financed the headquarters. The airline began leasing the facility from the airport, which owns the facility. As of 2015 American Airlines is the corporation with the largest presence in Fort Worth. In 2015 the airline announced it will build a new headquarters in Fort Worth. Groundbreaking began in the spring of 2016 and occupancy is scheduled for summer 2019. The airline plans to house 5,000 new workers in the building. It will be located on a 41-acre (17 ha) property adjacent to the airline's flight academy and conference and training center, west of Texas State Highway 360, 2 miles (3.2 km) west from the current headquarters. The airline will lease a total of 300 acres (120 ha) from Dallas-Fort Worth International Airport and this area will include the headquarters.Construction of the new headquarters is scheduled to occur after the demolition of the Sabre facility. As of November 2013 American Airlines and American Eagle received $10,011,836 in annual federal subsidies for Essential Air Services. These subsidies are awarded by public tender and ensure that small, rural airports can be connected to the national air network. The Allied Pilots Association (APA) is an in-house union which represents the 12,000 American Airlines pilots; it was created in 1963 after the pilots left the Air Line Pilots Association (ALPA). American Eagle pilots are ALPA members. The Transport Workers Union-International Association of Machinists alliance (TWU-IAM) represents the majority of American Airlines employed fleet service clerks, mechanics and other ground workers. American's customer service and gate employees belong to the Communications Workers of America/International Brotherhood of Teamsters Passenger Service Association. There are two separate seniority lists from predecessor companies that have not yet been integrated. Violations occurring over a 4½ year period—from October 1993 to July 1998—targeted American Airlines for using high-sulfur fuel in motor vehicles at 10 major airports around the country. Under the federal Clean Air Act high sulfur fuel cannot be used in motor vehicles. American Airlines promptly identified and corrected these violations of the Clean Air Act. American Airlines is title sponsor of two basketball venues: American Airlines Center (Dallas Mavericks) and American Airlines Arena (Miami Heat). On January 16, 2013, American launched a new rebranding and marketing campaign with FutureBrand dubbed, "A New American". This included a new logo replacing the logo used since 1967. American Airlines calls the new logo the "Flight Symbol", incorporating the eagle, star, and "A" of the classic logo. In the late 1960s, American commissioned designer Massimo Vignelli to develop a new livery. The original design called for a red, white, and blue stripe on the fuselage, and a simple "AA" logo, without an eagle, on the tail; instead, Vignelli created a highly stylized eagle, which remained the company's logo until 2013. In 1999, American painted a new Boeing 757 (N679AN) in its 1959 international orange livery. One Boeing 777 and one Boeing 757 were painted in standard livery with a pink ribbon on the sides and on the tail, in support of Susan G. Komen for the Cure. One Boeing 757 is painted with a yellow ribbon on the tailfin on the aircraft and on the side of the body says "Flagship Independence". American Eagle, the airline's regional airline has the same special livery on ERJ-145 aircraft. In the end, American let its employees decide the new livery's fate. On an internal website for employees, American posted two options, one the new livery and one a modified version of the old livery. All of the American Airlines Group employees (including US Airways and other affiliates) were able to vote. American ultimately decided to keep the new look. Parker announced that American would keep a US Airways heritage aircraft in the fleet, with plans to add a heritage TWA aircraft and a heritage American plane with the old livery. 2011–13: – "Be yourself. Nonstop." AA/TWA merger – "Two great airlines, one great future." 2001 (post-9/11) – "We are an airline that is proud to bear the name: American." 1988 – "The On-Time Machine." Late 1980s – "No other Airline gives you more of America, than American." 1982 – late 1980s – "En American, tenemos lo que tú buscas." (Spanish slogan, translated to "At American, we've got what you're looking for"). 1975 – 1984 – "We're American Airlines. Doing what we do best." (The tune used for the campaign would be retained for several years with the "Something special in the air" slogan). 1969 – 1971 – "It's good to know you're on American Airlines." 1967 – 1969 – "Fly the American Way." 1950s – 1964 – "America's Leading Airline." American currently operates ten hubs across the continental U.S.
Dallas/Fort Worth International Airport – American's primary hub, and its largest hub in terms of daily flights and number of destinations and American's primary hub for the South. American currently has about 85% of the market share and flies approximately 56 million passengers through DFW every year, which is about 153,000 people per day making it the busiest airline at the airport. American's corporate headquarters are also in Fort Worth near the airport. Dallas/Fort Worth remains the largest hub for American, in terms of passenger traffic since the American-US Airways merger. DFW serves as American's primary gateway to Mexico, and secondary gateway to Latin America. Charlotte Douglas International Airport – American's second-largest hub in terms of number of destinations and daily flights. It is American's primary hub for the Southeastern United States. About 42 million passengers fly through CLT on American every year, or about 115,000 people per day. As of 2013 American has about 90% of the market share at CLT, making it the airport's largest airline. Charlotte was previously US Airways' largest hub before the American-US Airways merger. O'Hare International Airport – The third-largest hub for American in terms of number of flights and American's primary hub for the Midwest. About 27 million passengers fly on American through O'Hare every year, or about 74,000 people per day. As of 2013 American has about 40% of the market share at O'Hare making it the airport's second-largest airline after United. O'Hare was American's second-largest hub before the American-US Airways merger. Philadelphia International Airport – The fourth-largest hub in terms of number of daily flights and American's primary East Coast hub. American flies approximately 23 million passengers a year through PHL, which is about 63,000 people per day. As of 2013 American has about 70% of the market share at PHL, making it the airport's largest airline. PHL was US Airways' second-largest hub before the American-US Airways merger. Philadelphia is American Airlines' primary European and transatlantic gateway. Miami International Airport – The fifth-largest hub in terms of number of flights. About 30 million passengers fly through MIA every year on American, which is about 82,000 people per day. American has about 70% of the market share at Miami International, making it the largest airline at the airport. Miami was previously American's third-largest hub before the American-US Airways merger. Miami is American's primary South American and Caribbean gateway. Phoenix Sky Harbor International Airport – The sixth-largest hub in terms of number of flights and destinations and American's primary western hub. American flies approximately 23 million passengers a year through PHX, which is about 63,000 people per day. Currently American has about 52.6% of the market share at PHX, making it the airport's largest airline. PHX was previously US Airways' third-largest hub before the American-US Airways merger. Phoenix is American Airlines' only major domestic hub without service to Asia and Europe (service to Europe is currently operated by Oneworld partner British Airways operating a Phoenix to Heathrow flight, however, no transoceanic flights currently exist on AA metal). Ronald Reagan Washington National Airport – The seventh-largest hub for American in terms of number of destinations and flights and American's third hub for the East Coast. The airport also serves as a base for American Airlines Shuttle. About 12 million passengers fly through DCA on American every year, or about 33,000 people per day. American has about 23.7% of the market share at DCA, making it the largest carrier at the airport. DCA was US Airways' fourth-largest hub before the American-US Airways merger. Los Angeles International Airport – The eighth-largest hub in terms of number of destinations and flights and American's hub for the West Coast. About 15 million passengers fly through LAX on American every year, or about 41,000 people per day. American has about 18.9% of the market share at LAX, making it the largest carrier at the airport. LAX was American's fourth-largest hub before the American-US Airways merger. LAX is American's primary transpacific gateway. John F. Kennedy International Airport – The ninth-largest hub for American in terms of number of destinations and flights and American's secondary East Coast hub. About 9.4 million passengers fly through JFK on American every year, or about 26,000 people per day. American has about 11% of the market share at JFK, making it the third-largest carrier at the airport behind Delta and JetBlue. JFK was American's fifth-largest hub before the American-US Airways merger. JFK is American's second primary European gateway. LaGuardia Airport – The tenth-largest hub for American in terms of number of destinations and flights and American's fourth hub for the East Coast. About 7.5 million passengers fly through LGA on American every year, or about 21,000 people per day. The airport also serves as a base for American Airlines Shuttle. American has about 28% of the market share at LGA, and is the second-largest carrier behind Delta. Lambert–St. Louis International Airport – American closed its St. Louis hub in 2009 because of the declining need for a second Midwestern hub. The St. Louis hub was inherited from Trans World Airlines. Luis Muñoz Marín International Airport – American closed its San Juan hub in 2012. American used San Juan as a connection point for Caribbean destinations using ATR-72 commuter aircraft. American has since removed the ATR-72 series aircraft from its regional fleet and closed its hub at San Juan. Nashville International Airport – American saw a decrease in passenger traffic and closed its Nashville hub in the mid 1990s to cut costs. Raleigh–Durham International Airport – American closed its Raleigh-Durham hub in the mid-1990s after it was deemed not profitable. San Jose International Airport – American closed its San Jose hub in the early 2000s. The hub was begun on December 2, 1988 with planned growth to 1991, soon after American acquired Air Cal and was seeking a Northern California hub either in San Jose or San Francisco. The San Jose hub was inherited with the acquisition of Reno Air. Reno Air had made San Jose a hub in the mid-1990s after American had decided that the competition on the West Coast made the hub unprofitable and closed it. Dallas/Fort Worth International Airport - Primary base for Airbus A319, and A321 aircraft, Boeing 777 and 787 aircraft, secondary base for Boeing 737, 757, 767, and McDonnell Douglas MD-80 aircraft. LaGuardia Airport - American operates a small maintenance base for Boeing 737 and ERJ-145 aircraft. Pittsburgh International Airport - Primary base for all legacy US Airways Airbus aircraft. Tulsa International Airport - Primary base for all of American's Boeing fleet (with the exception of the 777 and 787), as well as American Eagle aircraft. American operated interchange flight services in conjunction with Alaska Airlines during the 1970s between Texas and Alaska during the construction of the Trans-Alaska oil pipeline. This interchange agreement allowed for single, no change of aircraft service between Houston, Texas and Dallas/Fort Worth, Texas, and Anchorage, Alaska and Fairbanks, Alaska. The round trip routing of this interchange flight was Houston-Dallas/Fort Worth-Seattle-Anchorage-Fairbanks with Seattle, Washington serving as the interchange point where flight and cabin crews were changed from one airline to the other. Boeing 727-200 jetliners provided by both American and Alaska Airlines were utilized to provide this interchange service. In particular, American has joint ventures with British Airways, Iberia, and Finnair on transatlantic routes and with Japan Airlines and Qantas on transpacific routes. An American Airlines Boeing 777-200ER with the new livery departing Shanghai Pudong Airport in 2013. As of July 2016, American Airlines operates a fleet of 952 aircraft, making it the largest commercial fleet in the world. It operates a mix of Airbus, Boeing, Embraer, and McDonnell Douglas aircraft. Over two thirds of American's aircraft are narrow-bodies, mainly Airbus A320 series and Boeing 737-800. It also operates Boeing 757, Embraer 190 and McDonnell Douglas MD-82/83, but most of them are planned to be phased out within five years. Its wide-body aircraft are mainly Boeing airliners. It is the third-largest operator of the Boeing 767 series and the fifth-largest operator of the Boeing 777 series. It also operates the Boeing 787 and the Airbus A330. The Flagship Suite is American's international first class product, with the newest version being exclusively offered on all Boeing 777-300ERs in the fleet. The cabin features eight suites that are laid out in a 1-2-1 reverse herringbone configuration with direct aisle access. Each suite features an 80-inch (203 cm) long fully lie-flat seat with swivel capabilities (enabling the passenger to set up a dedicated work space), a 17-inch (43 cm) touchscreen monitor, and multiple AC power outlets and USB ports. Amenities that are exclusively offered to Flagship Suite passengers include Flagship check-in privileges, access to the Flagship Lounge, inflight wine tasting, a turndown service with pajamas, and a class-specific amenity kit. Other amenities include 3 complementary checked bags, early boarding, a pair of Bose QuietComfort Acoustic Noise Canceling Headsets, premium alcoholic beverage and wine selections (including pre-departure champagne service), chef-inspired dining options, and access to the premium cabin walk-up bar, which features assorted snacks and beverages throughout the duration of the flight. An older version of the Flagship Suite is available on select Boeing 777-200ERs. However, these aircraft are in the process of being retrofitted, with the first class section being replaced with an all-new, expanded business class. These aircraft feature 16 suites in a 1-2-1 configuration with direct aisle access, privacy dividers, and a 78-inch (198 cm) long fully lie-flat seat with swivel capabilities. Each seat comes equipped with an 8.4 inch tilting touchscreen monitor and a DC power outlet. • Airbus A330: Fully lie-flat Cirrus seats designed by Zodiac Seats France with direct aisle access in a 1-2-1 reverse herringbone configuration. Seat length: 76-80 inches (193–203 cm). Equipped with a 12.1 inch (30.7 cm) touchscreen monitor, universal AC power outlet and USB port. • Boeing 777-300ER: Fully lie-flat seats with direct aisle access in a 1-2-1 reverse herringbone configuration. Equipped with a 15.4 (39 cm) inch touchscreen monitor, universal AC power outlets, and USB ports. • Boeing 787-8 and retrofitted Boeing 777-200ER: Fully lie-flat seats with direct aisle access in a 1-2-1 reverse herringbone configuration with front- and rear-facing seats. Seat length: 77 inch (196.5 cm). Equipped with a 16-inch touchscreen monitor, two universal AC power outlets, and two USB ports. • Boeing 777-200ER pre-retrofit: Angled lie-flat seats in a 2-3-2 configuration. Equipped with a 10.6 inch touchscreen and a DC power outlet. These seats are currently in the process of being replaced. • Post-retrofit Boeing 767-300ER: Fully lie-flat seats designed by Thompson Aero Seating in a staggered 1-2-1 configuration with direct aisle access. Equipped with two universal AC power outlets and 2 USB ports. Seats are not equipped with a personal inflight entertainment system, but a Samsung Galaxy Tab™ 10.1 tablet is provided. • Boeing 767-300ER without retrofit: Angled lie-flat seats in a 2-2-2 configuration. Equipped with a DC power outlet. Not equipped with personal inflight entertainment. • Boeing 757-200: Legacy American 757s feature Recaro angled lie-flat seats in a 2-2 configuration equipped with a 10.4 inch (26 cm) tilting touchscreen monitor, and DC power outlets. Former US Airways 757s have 160° reclining seats in a 2-2 configuration equipped with DC power outlets. These seats are not equipped with a personal inflight entertainment system, but a Samsung Galaxy Tab™ 10.1 tablet is provided. All internationally configured 757s are to be retrofitted with new business class cabins featuring fully lie-flat seats and Wi-Fi. All international Business Class passengers are provided with the following amenities: three complimentary checked bags, Admirals Club access, early boarding, a pair of Bose QuietComfort noise-canceling headsets, premium alcoholic beverage and wine selections (including pre-departure beverage service), chef-inspired dining options, and class-specific amenity kits. Business Class passengers traveling on 787-8, 777-300ER, and retrofitted 777-200ER aircraft have access to the walk-up bar. • First Class: Seats are arranged in a 1-1 reverse herringbone configuration offering direct aisle access. They are fully lie-flat, and come equipped with a 15.4 (39 cm) inch touchscreen monitor, universal AC power outlets, and USB ports. These seats are similar to the ones in the Business Class cabin on the Boeing 777-300ER. Transcontinental First Class passengers receive exclusive amenities such as Flagship check-in at New York JFK and LAX, and an amenity kit that is identical to the one given to international Business Class passengers. 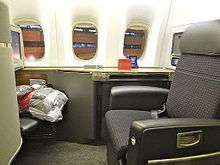 • Business Class: Fully lie-flat seats are set up in a 2-2 configuration. Equipped with a 15.4 inch (39 cm) touchscreen monitor, two universal AC power outlets, and two USB ports. Amenities offered to all Transcontinental premium cabin passengers include Admirals Club access, premium food and beverage options, and a pair of Bose QuietComfort Acoustic Noise Canceling Headsets. First Class is offered on all domestic mainline aircraft, as well as regional aircraft with more than 50 seats. When such aircraft are used on flights to international destinations including Canada, Mexico, Central America, and the Caribbean, the First Class cabin is branded as Business Class. Seats range from 19–21 inches (48–53 cm) in width and have 37–42 inches (94–106 cm) of pitch. Dining options include free snacks, beverages, and alcohol on all flights, with three-course meals offered on flights 900 miles (1,448 km) or longer (select routes under 900 miles offer meal service). On December 9, 2015, American announced a new Premium Economy product for most long-haul widebody aircraft. This new product will debut on the new 787-9s in late 2016 and will be available on the new A350s in 2018. It will also be retrofitted to all other widebody aircraft within the next three years, excluding 767s due to their upcoming retirement. The seats will be wider than standard Main Cabin seats and will offer 38" of pitch, 2" more than Main Cabin Extra seats, as well as a footrest. Premium Economy customers will also get two free checked bags, priority boarding, and enhanced food and drink service including free alcohol. This product will make American Airlines the first U.S. carrier to offer a four-cabin aircraft. American's economy plus product (not to be confused with premium economy), Main Cabin Extra, is available on most of the mainline fleet and American Eagle regional aircraft with more than 50 seats. Exceptions include a majority of former US Airways aircraft (as of May 2015), US Airways Express regional aircraft, and a handful of 777-200ERs that have yet to be retrofitted. Seats range from 17.2–18.5 inches (44–47 cm) in width and have 34–38 inches (86–97 cm) of pitch, which is 4–6 more inches of pitch offered in regular economy seating. American will retain Main Cabin Extra when the new Premium Economy product enters service in late 2016. Main Cabin is American's economy product, and is found on all mainline and regional aircraft in its fleet. Seats range from 17–18.5 inches (43–47 cm) in width and have 30–32 inches (76–81 cm) of pitch. Newer aircraft, including all Boeing 777-300ER, refurbished Boeing 777-200ER's, all Boeing 787 Dreamliners, all Airbus A330s, all Airbus A319s and Airbus A321s, and newly delivered Boeing 737s, include seatback TVs, featuring AVOD in each seat. American Airlines marketed increased legroom in economy class as "More Room Throughout Coach", also referred to as "MRTC" starting in February 2000. Two rows of economy class seats were removed on Boeing 737 and McDonnell Douglas MD-80 aircraft. Amid financial losses, this scheme was discontinued in 2004. The Admirals Club was conceived by AA president C.R. Smith as a marketing promotion shortly after he was made an honorary Texas Ranger. 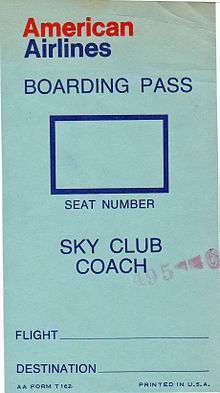 Inspired by the Kentucky colonels and other honorary organizations, Smith decided to make particularly valued passengers "admirals" of the "Flagship fleet" (AA called its aircraft "Flagships" at the time). The list of Admirals included many celebrities, politicians, and other VIPs, as well as more "ordinary" customers who had been particularly loyal to the airline. Though affiliated with the Admirals Club and staffed by many of the same employees, the Flagship Lounge is a separate lounge specifically designed for customers flying in First Class on transcontinental domestic flights and international flights, as well as AAdvantage Executive Platinum and Oneworld Emerald frequent flyers. Flagship Lounges are now available at four airports: Chicago-O'Hare, London-Heathrow, Los Angeles, and New York-JFK. American also previously offered a Flagship Lounge in Miami from 2000 to 2002, and again from 2009. It plans to open again in 2017. In the 1960s, Mattel released a series of American Airlines Stewardess Barbie dolls. Throughout the 1990s, American Airlines was featured in John Hughes' Home Alone trilogy of movies. In August 2008, during Season 2 of Mad Men (Episode 2, titled "Flight 1"), Pete Campbell's father was a passenger on American Airlines Flight 1. Flight 1 crashed shortly after takeoff from Idlewild Airport (now John F. Kennedy International Airport), killing all the passengers and crew on board. American Airlines was extensively featured in the 2009 movie Up in the Air as part of a marketing tie-in between the airline and Paramount Pictures. American Airlines is the preferred airline of protagonist Ryan Bingham (George Clooney). A significant plot point includes Ryan's quest to reach the ten-million-miler level of the AAdvantage frequent flier program. Many of the airport scenes were filmed in unused yet still branded AA terminal space at Lambert Airport, and all of the airplane scenes were filmed in borrowed AA airplanes. In 2013, American Airlines collaborated with Disney to promote Planes by featuring a cameo appearance of a passenger airliner named Tripp, with the new American Airlines livery to promote its new image. Airport 1975 used a Boeing 747-123 Freighter (cargo variant) s/n 20390 (registration N9675), leased from American Airlines. 1 2 "History of American Airlines". American Airlines Inc. 2015. Retrieved June 30, 2015. ↑ "Hub and State Fact Sheets". American Airlines, Inc. 2014. Retrieved December 28, 2015. 1 2 "Oneworld at a glance". Oneworld. November 2015. Retrieved December 28, 2015. ↑ "American Airlines Group − About us − American Airlines". Aa,com. Retrieved 2016-09-17. ↑ Associated, The (September 12, 2012). "American Air signs deal to contract out some flying to SkyWest". Yahoo! News. Retrieved October 3, 2012. ↑ Koenig, David (November 29, 2011). "American Airlines parent seeks Ch. 11 protection". Google News. Associated Press. Archived from the original on December 4, 2011. Retrieved 7 December 2011. ↑ "Corporate Structure." American Airlines. Retrieved 18 May 2009. ↑ "American Airlines Group Overview Archived copy at WebCite (April 24, 2014)." (Archive). American Airlines. Retrieved on April 24, 2014. ↑ World Airline Directory. Flight International. March 20, 1975. "472. ↑ "Flatiron / Gramercy / Murray Hill / Union Square: Manhattan Neighborhood Map." About.com. Retrieved 25 January 2009. ↑ Sterba, James P. "American Will Shift Headquarters From Manhattan to Dallas Airport; Big Economies Predicted." The New York Times. Thursday November 16, 1978. Page A1. Retrieved 27 August 2009. 1 2 "American Airlines Finishes Moving into Headquarters Monday." Associated Press at Ocala Star-Banner. January 16, 1983. 6A. Google News 4 of 62. Retrieved 27 August 2009. 1 2 3 4 Brown, Steve. "American Airlines will build new headquarters in Fort Worth" (Archive). The Dallas Morning News. October 22, 2015. Retrieved on October 27, 2015. "Robert Sturns, Fort Worth's economic development director, said the city was committed to keeping its largest corporate citizen." 1 2 3 Owens, Marjorie, Jason Whitely, and Jim Douglas. "American to build new headquarters in Fort Worth" (Archive). WFAA. October 22, 2015. Retrieved on October 24, 2015. ↑ "Archived copy" (PDF). Archived from the original (PDF) on 2014-07-14. Retrieved 2016-06-20. ↑ "Archived copy". Archived from the original on 2016-02-04. Retrieved 2016-02-05. ↑ "Envoy Air - ALPA". www.alpa.org. Retrieved 2016-10-26. ↑ "American Airlines flight attendants to get bigger pay raises after all". Dallasnews.com. Retrieved 2016-09-17. ↑ "American CEO says contract proposals to ground workers to have "double-digit" pay increases". Star-telegram.com. Retrieved 2016-09-17. ↑ Sheryl Jean. "American Airlines customer service and gate agents approve new labor contract". Airline Biz Blog. ↑ "American Airlines Will Make Clean Air Improvements at Logan Airport Reports to EPA the Use of Illegal High Sulfur Fuel in Motor Vehicles". United States Environmental Protection Agency. July 19, 1999. Archived from the original on July 7, 2007. Retrieved January 25, 2009. ↑ "American Airlines Receives Texas Commission on Environmental Quality's Governor's Award". Airline Industry Information. May 11, 2006. ↑ "American Airlines Extends Sponsorship With Carolina Panthers". Nasdaq:GN. 2015-07-25. Retrieved 2016-10-25. ↑ "American Airlines scores big as new official airline of Cubs". Chicago Tribune. 2015-02-05. Retrieved 2015-02-07. ↑ "American Airlines Announces Exclusive Sponsorship and Promotions Agreement With the Dallas Cowboys". American Airlines. 2007-10-07. Retrieved 2015-02-07. ↑ "Dallas Mavericks on the Forbes NBA Team Valuations List". Forbes. January 2016. Retrieved 2016-10-25. 1 2 "American Airlines, New England Patriots and New England Revolution Kick Off an Exciting New Partnership". American Airlines. 2013-02-13. Retrieved 2015-02-07. ↑ "Tales From an Era When Airlines Knew Good Design". WIRED.com. Retrieved May 22, 2015. ↑ "Vignelli Associates About the AA Logo". Vignelli.com. Retrieved December 2, 2011. ↑ "iconic logo designers". logosdesigners.com. Retrieved April 3, 2015. 1 2 "Becoming a new American". aa.com. Retrieved March 6, 2013. ↑ "American Airlines unveils new logo, livery". Chicago Tribune. January 17, 2013. Retrieved January 17, 2013. ↑ "Delta, Air Canada Among Carriers Weighing Benefit of Paint Stripping". Industry.bnet.com. 8 October 2008. Retrieved December 2, 2011. ↑ Ahles, Andrea (January 18, 2013). "Star-Telegram 18 January 2013: "American Airlines shows off new look for new era"". Star-telegram.com. Archived from the original on January 1, 1970. Retrieved January 29, 2014. ↑ King, Eric. (2013-03-28) American Airline's New Livery Soon Could Become Its Old Look | NBC 5 Dallas-Fort Worth. Nbcdfw.com. Retrieved on 2013-07-18. ↑ "The World's Greatest Flyers Fly American". American Airlines. September 2, 2016. Retrieved September 2, 2016. ↑ Elliott, Stuart (November 17, 2014). "Ads for American Airlines Seek 'Great' Results". The New York Times. Retrieved 27 July 2015. ↑ "US Airways Merger with American Airlines". New American Arriving. Retrieved March 29, 2013. ↑ "American Airlines Escape Commercial". YouTube. Retrieved January 4, 2014. ↑ "TWA and AA merger commercial". YouTube. Retrieved January 4, 2014. ↑ "American Airlines Post 9-11 Ad Campaign (Part 2)". YouTube. Retrieved January 4, 2014. ↑ "American Airlines commercials - 1992". YouTube. Retrieved January 4, 2014. ↑ "American Airlines Based Here, Best Here commercial 1988". YouTube. Retrieved January 4, 2014. ↑ "American Airlines TV Commercial 1988". YouTube. Retrieved January 4, 2014. ↑ "1987 American Airlines Commercial". YouTube. Retrieved March 29, 2013. ↑ "JINGLE: AMERICAN "DOING WHAT WE DO BEST" (1975)". Fly The Branded Skies. Retrieved January 4, 2014. ↑ "American Airlines Introduces the DC-10 - 1971". YouTube. Retrieved March 29, 2013. ↑ "American Airlines 1970s Commercial - The One Minute Vacation". YouTube. Retrieved January 4, 2014. ↑ "Fly the American Way!". YouTube. Retrieved January 4, 2014. ↑ "American Airlines...An Airline Built for Professional Travelers". YouTube. Retrieved January 4, 2014. 1 2 3 4 5 "DFW :: American Airlines Newsroom". aa.com. 1 2 3 4 5 "CLT :: American Airlines Newsroom". aa.com. 1 2 3 4 "ORD :: American Airlines Newsroom". aa.com. 1 2 3 4 5 "PHL :: American Airlines Newsroom". aa.com. 1 2 3 4 5 "MIA :: American Airlines Newsroom". Hub.aa.com. Retrieved 2016-09-17. ↑ ":: American Airlines Newsroom". Hub.aa.com. Retrieved 2016-09-17. 1 2 3 4 5 "Loss of a corporate headquarters may cost Phoenix jobs, prestige". Dallasnews.com. Retrieved 2016-09-17. 1 2 3 4 "DCA :: American Airlines Newsroom". aa.com. 1 2 3 4 5 "LAX :: American Airlines Newsroom". aa.com. 1 2 3 4 5 "JFK :: American Airlines Newsroom". aa.com. 1 2 3 "LGA :: American Airlines Newsroom". aa.com. ↑ "American Kills St Louis, Strengthens Other Hubs". The Cranky Flier. ↑ "American Eagle to close San Juan hub – sources". Dominica News Online. ↑ ""Nashville Airport not mourning loss of hub"". Archives.californiaaviation.org. Retrieved 2016-09-17. ↑ ""Charlotte, N.C., airport looks to Raleigh-Durham for how to handle loss". Archived from the original on 2016-04-06. ↑ DALLOS, ROBERT E. (5 October 1988). "American Airlines Selects San Jose Airport for Hub" – via LA Times. 1 2 3 4 "Archived copy". Archived from the original on April 24, 2014. Retrieved April 17, 2014. ↑ "Profile on American Airlines". CAPA. Centre for Aviation. Archived from the original on 2016-10-28. Retrieved 2016-10-28. ↑ "American Airlines And Korean Air Announce Codeshare Agreement :: American Airlines Newsroom". Hub.aa.com. Retrieved 2016-09-17. ↑ Esterl, Mike (October 7, 2010). "BA, Iberia, American Launch Venture, Add Routes". The Wall Street Journal. ↑ Martin, Timothy W. (April 1, 2011). "AMR, JAL Forge a Partnership". The Wall Street Journal. ↑ Walton, John (November 11, 2011). "US govt greenlights Qantas & American Airlines joint venture". Australian Business Traveller. 1 2 "American Airlines Boeing 777-300ER". aa.com. Retrieved May 23, 2015. ↑ "American Airlines Boeing 777 First Class". aa.com. Retrieved May 23, 2015. ↑ "US Airways A330 Business Class". Retrieved May 23, 2015. ↑ "American Airlines Boeing 777 Business Class". aa.com. Retrieved May 23, 2015. 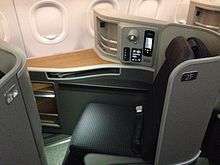 ↑ "American Airlines Unveils New 767-300 Cabin". Airways News. March 20, 2014. Retrieved May 23, 2015. ↑ "American Airlines Boeing 767 Business Class". aa.com. Retrieved May 23, 2015. ↑ "US Airways 757 International Business Class". Retrieved May 23, 2015. ↑ "American celebrates its first anniversary with US Airways, outlines an upgraded travel experience going forward". World Airline News. December 8, 2014. Retrieved April 21, 2015. 1 2 3 "American Airlines Airbus A321 Transcontinental Business Class". Retrieved May 23, 2015. 1 2 3 "American Airlines Planes and Seat Maps". tripadvisor.com. Retrieved May 24, 2015. ↑ "First and Business Class Dining". aa.com. Retrieved May 24, 2015. 1 2 "American Airlines Premium Economy - The Only North American Carrier to Offer a 4 Cabin Aircraft". upgrd.com. ↑ "History of American Airlines - About us - American Airlines". Aa.com. Retrieved 2016-09-17. 1 2 "USATODAY.com - American Airlines squeezes passengers in tighter to make money". Usatoday30.usatoday.com. 2004-10-21. Retrieved 2016-09-17. ↑ Sanburn, Josh. "American Airlines Offering More Legroom … For a Price" – via business.time.com. ↑ Li, Lucy. "Ultimate Guide to Admirals Club". LoungeBuddy. LoungeBuddy, Inc. Archived from the original on 20 July 2015. Retrieved 20 July 2015. ↑ "Toward Equality for VIPs". TIME. July 15, 1966. Archived from the original on January 14, 2009. Retrieved January 26, 2009. ↑ "Flagship Lounges − Clubs − American Airlines". Aa.com. 2015-09-25. Retrieved 2016-09-17. ↑ "Flagship Lounge(R)". American Airlines. Retrieved December 2, 2013. ↑ "AA lounge opens at Miami International". Business Traveller. February 16, 2009. Retrieved January 29, 2014. ↑ Andrew Adam Newman (December 20, 2009). "A Dream for an Airline and a Hotel Chain". The New York Times. ↑ Up in the Air (2009). IMDB.com. Retrieved on September 17, 2014. ↑ Disney Collaborates With American Airlines for PLANES. Toonbarn.com (July 1, 2013). Retrieved on July 1, 2013. ↑ Santoir, Christian. "Airport 75." Aeromovies. Retrieved: December 27, 2015.